There are twelve signs in the zodiac, and each holds an energy waiting to be unlocked. Astrology is the study of what each sign holds and when to maximize the flow of this stored energy when it is let out. The ancients learned that when the Sun visits a zodiac sign, the elements of this sign were activated. Timing your choices on earth to coincide with activity in the heavens is the best way to balance accomplishments with enjoyment of your life. The zodiac cycle starts when the Sun crosses the equator headed north. This signals the start of spring. But before the beginning, we honor the final sign of the zodiac: Pisces. This is the sign of moving beyond language to communicate with visual representation, music and actions. The old saying “actions speak louder than words” epitomizes the Piscean purpose. To be of service instead of talking, to act in the interests of the greater good without regard for convention and to keep going without speaking about your plan. 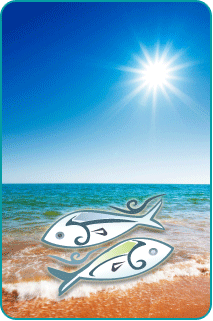 All of us can benefit from the four weeks that the sun spends in the zodiac sign of Pisces. This is a time to abandon explanations and rationalizations, roll up your sleeves and do the work that needs to be done. Who will serve the servants? When the Sun is in Pisces, it will be the person with a complete sense of purpose. Read your sign below to see where you can help out in order to bring the greater good. The Sun enters Pisces on Friday, February 18 and is there until it crosses the equator to signal the Vernal Equinox on the afternoon of Sunday, March 20. During this forecast time, everyone receives cosmic energy to help further their greatest life goal. Now it is up to you to use it as best your zodiac sign can handle. You can be of use to someone less fortunate than you by allowing this person access to something that he or she ordinarily would not have. Whether you pull strings with the powers that be or look the other way as others move into the neighborhood, passive acceptance of people benefits you in ways that will be paying you back years from now. You have the ear of a large audience while the Sun is in Pisces. You can get the word out for someone who needs as many people as possible to know something. What good is a network of friends if you are not creating a positive step forward for someone by marshaling the forces at your disposal? A slow pace allows you to take in all of the adventure to which you have been assigned. Whether you randomly ended up in this exciting situation or have been making the moves to get ahead all along, the critical thing is to understand that you are here now and can impress everyone with your skill at getting things done. While an investor could stumble upon your project and back you, the more likely scenario is that you can dramatize why what you are doing is so needed by others. In appealing to their deep desires, you can attract people to sing your praises and gain the notice of those who would take you along further than you could ever go yourself. Partnerships are put under a strain that demand more from you than you might be willing or able to give. You have reached the point of no return in a relationship that might have been going nowhere. Do you fight now to prove you are worthy or run for freedom and start all over again in the spring or summer? And if you do, will love come around as easily the next time? Paying attention to the details does not require great research. In fact, while the Sun is in Pisces, pay more attention to how things make you feel than what you are thinking. It is in making an emotional connection that you can give someone what he or she really wants and simultaneously help yourself out as you put together a deeper understanding of who you are. Studying hard to be all you can is not as valuable as actually investigating what works. If you are better able to be a scientist than a truck driver, take your foot off the pedal and help advance the whole human race with your expanded knowledge. The big picture awaits your vision in order to be completed. The four weeks that the Sun spends in the zodiac sign of Pisces will keep you preoccupied with a project at home. Look to see how this work you do can be expanded to be of use to others. There is nothing wrong with making the world a better place for yourself, but the chance to make a memorable difference in the lives of others can be your greatest accomplishment. Fighting the urge to talk bad about someone is often the polite thing to do. But Pisces is the time of year you should utilize to let people know what you know. Someone is desperately seeking the facts and the chance for you to fill in the blanks won’t even cost you much time. Some talent you have comes in handy. You will be asked for a loan and you might be reticent to give up the money as you feel like you might never see it again. It is time to ask the universe to back up what you put out into the world. The material side of things will take care of themselves. You are being challenged to grow in empathy and the price of doing so is actually quite low. The Sun in your sign will mean a happy birthday, and the celebration may last days with two more cakes and an untold number of bottles of your favorite drinks. The need to assert the coming year as yours, though, must be tempered with accepting that others in your life will be sharing the spotlight. Make sure to express your appreciation with deeds as well as words.